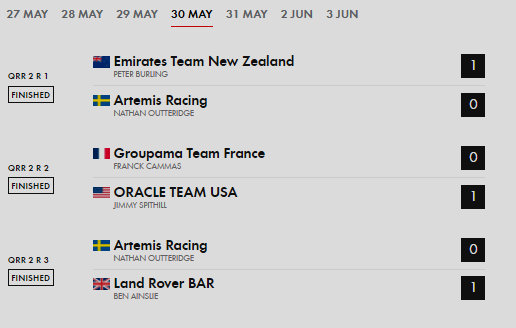 May 30, 2017: Another big battle between Artemis Racing and Emirates Team New Zealand. 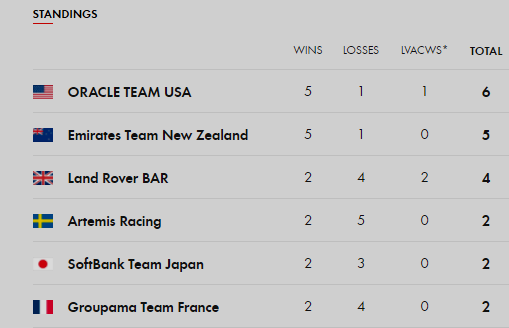 It took until late in the race toward the final top mark that Emirates Team New Zealand​ pounced to take the lead and clock up another point. Peter Burling​ and Blair Tuke​ take us through the thriller. May 30, 2017: Qualifiers Race Day 4 preview: Martin looks at the day ahead with Emirates Team New Zealand​'s Kevin Shoebridge. It's a rematch with Artemis racing, will it be as epic as yesterdays race? Streamed LIVE May 29, 2017. Summary of the third day of racing at the 35th America's Cup yacht race in Bermuda on May 29, 2017. Day three of the Louis Vuitton America’s Cup Qualifiers was a day in which the five challenging teams; Land Rover BAR, Artemis Racing, SoftBank Team Japan, Groupama Team France and Emirates Team New Zealand, had their chance to enhance their positions on the leaderboard and close the gap on Defenders of the ‘Auld Mug’ and table-toppers ORACLE TEAM USA who sat out of action, having raced three times on day two. May 28, 2017: Summary of Day #2 of sailing racing at the 2017 America's Cup in Bermuda, held on Sunday May 28 2017. May 28, 2017: Two Races and two wins for Emirates Team New Zealand on what was described by Skipper Glenn Ashby as an incredibly tricky day in Bermuda! Discover Bermuda’s Great Sound | GoToBermuda.com: "Known as one of the world’s best places to sail, Bermuda’s Great Sound is a natural treasure for those who love being on the water. See how to experience it for yourself." WMRT Porec Match Cup 2017 | World Match Racing Tour May 26-28, Croatia: "2017 marks the year when Porec picks up the torch and brings back the World Match Racing Tour to the Adriatic at Peskera Bay, Croatia. This World Tour level event will qualify the top two teams to the World Championship level event Match Cup America in September." Video above published May 22, 2017: Boat Captain Feargal Finlay talks about the systems onboard a TP52 racing sailboat. Video above published Mar 14, 2017: Step into the mind of a Tactician. Full Race with audio from tactician Terry Hutchinson! Multiple camera angles & Drone view of Race 8 in the 52 Super Series 2017 Miami Royal Cup. Video produced by Keith Brash. Video above published May 19, 2017: He is the architect of the modern America’s Cup and in the second part of our exclusive interview, Sir Russell Coutts describes how sailing’s most prestigious event might influence sailing in the future. By the time teams launch their race boats, some will have built five boats for this America’s Cup cycle. In the second part of our exclusive interview, Coutts talks candidly to World Sailing about how the future America’s Cup may look. Video above published May 10, 2017: What's under the skin of an ACC cat? With the help of Groupama Team France we take a look at what lies within the modern America's Cup Class designs and what makes them tick. 35th America's Cup (AC35) will be raced in Bermuda in June, 2017, with the Louis Vuitton America’s Cup Qualifiers & Challenger Playoffs scheduled for 26th May – 12th June 2017. Video above published May 15, 2017: Sir Russell Coutts is one of sailing’s most decorated sailors. To add to the long list of World Championships he has an Olympic Gold medal and has won the America’s Cup five times, three as skipper. But his reputation hangs on more than simply pointing a boat in the right direction. In 2010 he swapped the wheel for the reins and announced a bold, ambitious and controversial vision for the next America’s Cup, the move to catamarans. And the Cup has never looked back. He talks candidly and exclusively to World Sailing. Published May 24, 2017: Pure energy, pure entertainment and PURE PERFORMANCE – the TP52 World Championship had it all, and more! Next stop: Sardinia for the Audi 52 SUPER SERIES Sailing Week. Racing starts again on 21st June. Full recap here. May 20, 2017:The ROLEX​ TP52 World Championship title all came down to this one, final race. Next stop: Porto Cervo for the Audi 52 SUPER SERIES Sailing Week. Racing starts again on 21st June. Final Day 5 LIVE Video Replay of the Rolex TP52 World Championship Scarlino 2017. The penultimate day of racing sets us up for a super Saturday showdown! Watch the final day LIVE, via www.52SUPERSERIES.com or through the app. Day 4 of the Rolex TP52 World Championship Scarlino 2017 streamed LIVE May 19, 2017. Published on May 19, 2017: Indulge yourself with these glorious images of the TP52s surfing the untouched Tuscan coastline in yesterday's Coastal Race. Watch Day 4 LIVE, via www.52SUPERSERIES.com or through the app. Harm Müller-Spreer’s German-flagged team on Platoon has taken over the lead of the Rolex TP52 World Championship, earning themselves a cushion of three points ahead of defending world champion Quantum Racing. May 16, 2017--"The fleet is incredibly open, this is a challenging venue, and everybody is on." --Tuesday 16th May, Scarlino: After a long and challenging day on the waters off Scarlino, Tuscany, Quantum Racing – the defending champions – lead the Rolex TP52 World Championship by virtue of winning the one and only race sailed. Venue: Marina di ScarlinoOn the western coast of Tuscany lies the Marina di Scarlino, one of the top racing venues in the Mediterranean. A modern and fully equipped marina, which hosts the Club Nautico Scarlino, is perched on the coastal side of Mount Alma and is starkly contrasted by the relatively untouched, medieval commune of Scarlino. Video above published May 3, 2017: The America's Cup has always been about pushing the limits of technology in sailing, particularly in recent years. One of the hallmarks of the modern America's Cup is the introduction of foiling, reaching speeds never seen before and allowing the boats to literally "fly" above the water. The America's Cup Revolution: There has been a revolution in the America's Cup - a shift from monohulls racing far offshore to incredibly fast, foiling catamarans raced close to shore by high-performance athletes. Yet over 166 years the spirit of the America's Cup has remained the same, with sailing's best and brightest pushing the boundaries to win the oldest trophy in international sport. Video above published May 12, 2017: In this episode, America's Cup CEO Russell Coutts discusses the amazing progress Bermuda has made thus far with the construction of the AC Village and the readiness of the 6 teams to compete. Over the course of the final practice races, the teams will need to refine their techniques and prepare for the qualifiers in 2 weeks. Video above published May 16, 2017: Stephen Murray Jr.'s Volvo 70 Warrior, finished the 2017 Antigua Bermuda Race on Tuesday 16 May 2017 taking Monohull Line Honours and setting the Monohull Race Record for the Antigua Bermuda Race of 3 days 20 hours 32 mins & 41 secs. 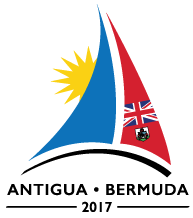 Video above published May 13, 2017: Start of the first Antigua Bermuda Race organised by the Royal Bermuda Yacht Club in association with Antigua Sailing Week. Sponsored by Goslings Rum and Bermuda Tourism. Antigua Bermuda Race organised by the Royal Bermuda Yacht Club in association with Antigua Sailing Week: An impressive entry list is taking shape for the Antigua Bermuda Race which starts from Antigua on Friday 12th May, 2017. With 22 entries, including 17 over 50ft and seven Maxis and one SuperMaxi, the sight of the fleet departing for the 900 nautical mile race will be nothing short of spectacular. The variety of the fleet shows the wide appeal of the offshore race, attracting ocean going cruisers, round the world racing yachts, high performance multihulls, as well as classic designs. The latest entry to the Antigua Bermuda Race is the beautiful classic Bermudian yawl, Mariella, skippered by owner, Carlo Falcone. The 80ft (24m) Alfred Mylne-designed ketch was built entirely from wood by the legendary William Fife & Son yard in Scotland in 1938 and was lovingly restored by Carlo after being badly damaged in a hurricane. Mariella is now in fantastic condition and on top form having secured overall victory in the recent Panerai Antigua Classic Yacht Regatta. One of the first yachts to enter the Antigua Bermuda Race was Spirit of Bermuda and there is more than meets the eye to the 112ft three-masted schooner. Just a couple of weeks before the start of the Antigua Bermuda Race, Spirit of Bermuda was racing with the giants at Antigua Classic Yacht Regatta. Spirit of Bermuda got the better of the 141ft (43m) Columbia and gave the professional crew on the 210ft (64m) Adix a run for their money. Spirit of Bermuda is owned by the Bermuda Sloop Foundation, the brain child of founder Malcolm Kirkland, with co-founders Jay Kempe and Alan Burland. Bermuda to Port, finish off St David’s Light Bermuda. America's Cup, 26 May - 27 June, 2017, Bermuda: "There Is No Second"
In 1851 Commodore John Cox Stevens, a charter member of the New York Yacht Club (NYYC), formed a six-person syndicate to build a yacht with the intention of going to England and make money competing in yachting regattas and match races. The syndicate contracted with pilot boat designer George Steers for a 101 ft (30.78 m) schooner, which was christened America when launched 3 May 1851. On 22 August 1851, America raced against 15 yachts of the Royal Yacht Squadron in the Club's annual 53-nautical-mile (98 km) regatta around the Isle of Wight. America won, finishing 8 minutes ahead of the closest rival. Reportedly, Queen Victoria, who was watching at the finish line, asked who was second, the famous answer being: "Ah, Your Majesty, there is no second." The surviving members of the America syndicate donated the cup via the Deed of Gift of the America's Cup to the NYYC on 8 July 1857, specifying it be held in trust as a perpetual challenge trophy to promote friendly competition among nations. 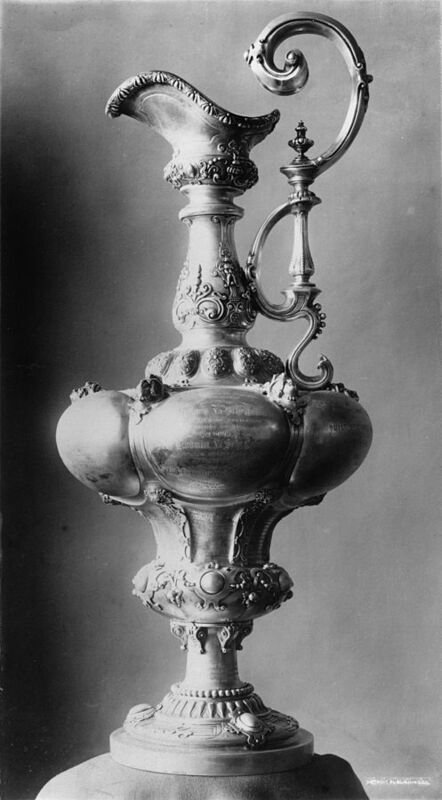 The America's Cup is the oldest international sporting trophy. Video above published May 10, 2017, by AmericasCup.com: “Your Majesty, there is no second”. A four-word phrase spoken to Queen Victoria in 1851 that to this day exemplifies the America’s Cup and its winner-takes-all pursuit of excellence. The battle for the 35th America's Cup will be just as fierce as that first America's Cup, as there still is no second in the oldest trophy in international sport. The key players of the 35th America's Cup talk about why this trophy is so coveted, so prestigious, and so difficult to win. Since 1851 the America's Cup trophy has represented the pinnacle of sporting achievement, and it is no different today. The Martini Racing AC33: not only does it look the part, but it performs superbly in all conditions! Antigua Sailing Week 2017: One of the favourites for the Lord Nelson Trophy, Ross Applebey's Oyster 48, Scarlet Oyster was called over the line at the start and did not return for some time. However, the Scarlet Oyster team rolled up its sleeves picking off the opposition one-by-one to scrape back into second position. Jonty Layfield's Swan 48, Sleeper X took the gun and the race win, but Scarlet Oyster is CSA 5 champion. In other hot classes, Sergio Sagramoso's Melges 32, Lazy Dog scored its fourth bullet. Bajan TP52, Conviction, skippered by Clint Brooks scored its seventh win, as did Maxi, Kialoa III and Sir Peter Harrison's Super Maxi, Sojana. There were also other prizes to win, including three of the CSA Class winners and Bareboat One, which were hanging in the balance. Video above published May 5, 2017: Yacht racing highlights of 50th edition Antigua sailing week! Video above published May 2, 2017: Its all go on race day 3 as leaders emerge in divisions A and B. Ride with a cutting edge Polish catamaran and with a team of German girls battling for the podium in their bareboat class. Published Apr 24, 2017: Sights and sounds of Day Three at Sperry Charleston Race Week 2017 - the largest sailing event of its kind in the Americas. Published on Apr 22, 2017: Sights and sounds of Day Two at Sperry Charleston Race Week 2017 - Charleston, South Carolina - the largest sailing event of its kind in the Americas. Sperry Charleston Race Week - April 20-23, 2017: Race Week Culminated with Moderate Winds and High Spirits--After three days of intense competition across 16 different classes of sailboats, the biggest keelboat regatta in the Americas was filled with exciting racing, rockin' beachside parties and some great camaraderie. Published Apr 27, 2017: SoftBank Team Japan and ORACLE TEAM USA lined up on the Great Sound in their new America's Cup Class boats, with very fast results--even at speeds of over 40mph the chase boat was struggling to keep up with these racing machines--as training and development continues in preparation for the 35th America's Cup. Published Apr 27, 2017: We caught up with key personalities from each of the six America's Cup teams on the America's Cup 'preseason' that is practice racing. The teams are currently engaged in the third of four practice racing periods in their America's Cup Class boats, and seeing improvements every day. Winding the clock back on a Volvo 65 and taking a race boat that already has over 40,000 hard miles under its keel might not be your idea of a perfect start for another lap of the planet. But the newly refurbished fleet of Volvo 65s are better than new. We went to Portugal to find out how this can be so. Plus, capsizing a $multimillion America’s Cup catamaran raises heart rates. We find out how AC foiling works. We head to Palma for the Tropheo Princesa Sofia and then to Miami for the TP52 Super Series. Over the next four years, SAP will bring its cutting-edge, innovative solutions to World Sailing's World Cup Series of events. Video above published Apr 30, 2017--A 60 second round up from France. See JohnTheCrowd.com: World Sailing's 2017 World Cup Series Hyeres, France, April 23-30 for all the video highlights! Video above published Apr 30, 2017: The full Medal Race from France.